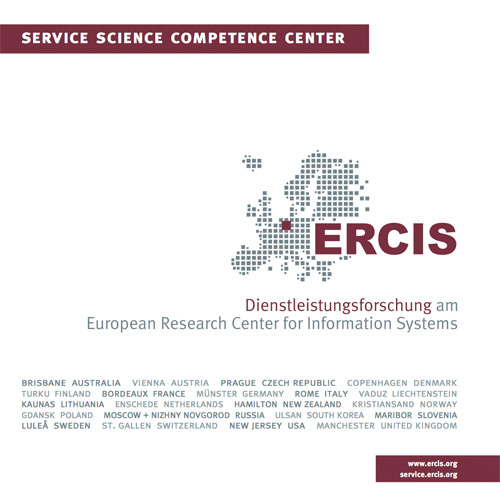 ECIS 2015 Workshop | ERCIS Competence Center "Service Science"
The ECIS 2015 workshop "Innovating, Designing and Managing Service Systems with IS" will be held at the Service Science Competence Center in Münster, Germany, on 26th Mai 2014 by the AIS Special Interest Group Services (SIG SVC). An increasing number of activities of public and private organizations are engineered and managed as services, often creating innovations for economic growth and social welfare. This development is mirrored in the domain of information systems (IS), and becomes evident in the use of services as the organizing logic for providing IS, in the use of services as an architectural paradigm (SOA), and in the design of Cloud/Internet-based services for information, processes, applications, and IT-infrastructures. Moreover, the increasing amalgamation of information and communication technology (ICT)-enabled corporate and consumer services offer substantial opportunities for service innovation. Examples for augmenting the physical world with services include Near Frequency Communication (NFC)-enabled frequent flyer cards at Air New Zealand that facilitate check-in and identity verification, mobile ticketing for public transportation services, apps for music festival participants to interact, or tablet-based services for ordering food and drinks at a casino or restaurant. Often, the focal points are the infusion of ICT into services and transferring service-dominant logic thinking into ICT development and use.